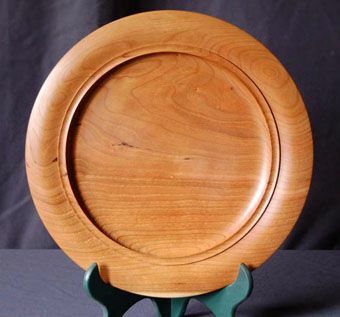 My wooden plates, wooden platters and Lazy Susans are individually turned on a lathe. Each one within a wood species will be unique due to mother nature's process of producing our wonderful trees as well as the fact that each one is individually hand turned. I try to make each item out of one piece of wood but some of the larger items may be made up of pieces of wood glued together. Be assured that the glue used is waterproof. You may see several examples and sizes on my website. I intend for these items to be functional. You can use them to eat meals on or as serving plates. 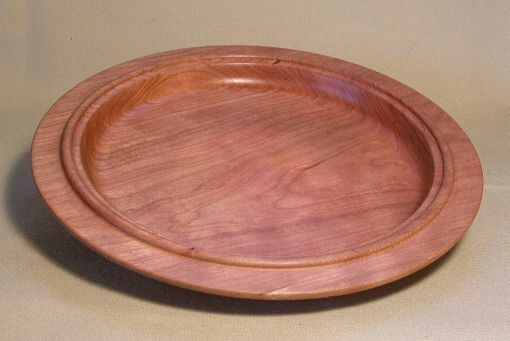 This plate is made of solid wood and it may experience some slight distortion. Wash without soaking and do not place it in your dishwasher. The finish on this plate is mineral oil and can be reapplied at any time to bring back its original luster. Do Not use in a microwave oven.